Another speaker was Marco Fortis, economist and Vice President of Fondazione Edison, who presented an analysis of the Italian economic scenario with a focus on the plastics and rubber industry. 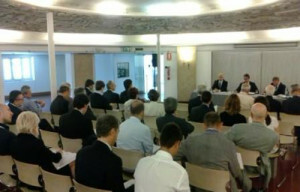 This was followed by a round-table discussion on the topic of internationalization with the participation of Licia Mattioli, President of the CONFINDUSTRIA Technical Committee for Internationalization and Foreign Investors, along with the presidents of the two trade asso-ciations and a number of businesspeople. In his thoroughgoing speech, Fortis indicated that there are a number of signals that make it reasonable to look to 2015 with (cautious) optimism. Apart from the recent improvement in macroeconomic data – growth of 0.3% in GDP in the first quarter of 2015, weak euro with re-spect to the dollar and low oil prices – and in light of the comments recorded during PLAST 2015 (organized by the Assocomaplast services company) we may state, albeit with some caution, that there are signs of recovery in the Italian conversion market. They are still faint, but hopes are that they will grow stronger in the second half of the year. Import-export data from ISTAT for the first quarter 2015 show an increase in imports of an impressive 15 percentage points, and of exports on the order of 5, thanks first of all to increases is supplies from Germany (which has always been the prime export market for Italian manufacturers), Spain (which shows signs of recovery on a number of fronts) and Brazil, traditional destination country for Italian-made products in the sector, which in previous quar-ters had unfortunately shown a worrisome slowdown. As regards exports, in spite of the continuing existence of various critical or potentially destabi-lizing situations, both political and economic (for example in Russia, Iran, Greece, South America, etc. ), the US and Germany economies are strengthening and the Chinese economy is stabilizing. These are factors that may have a positive influence on the Italian plastics and rubber processing machinery industry. In his closing speech to the member assembly, outgoing Assocomaplast president Giorgio Co-lombo provided an overview of the trend for the sector with the above-mentioned 2015 data and underscored once again that 2014 was a year of substantial recovery for the Italian plastics and rubber processing machinery industry, with production estimated at 4 billion euros (+2.6% with respect to 2013) and exports growing by 5% (to 2.68 billion euros).